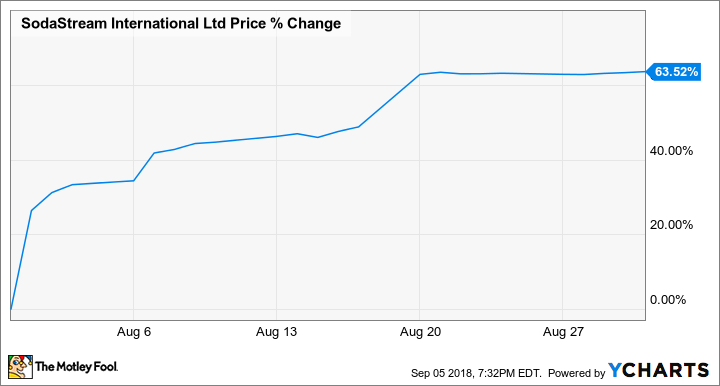 SodaStream (NASDAQ:SODA) stock climbed 63.5 % in August, according to data provided by S&P Global Market Intelligence. The company's share price skyrocketed following blockbuster quarterly results, then posted more big gains later in the month on news that the business was being acquired by PepsiCo (NASDAQ:PEP). SodaStream published second-quarter results on Aug. 1, delivering sales and earnings that came in well ahead of the market's expectations, and it made big upward revisions to its full-year targets. Pepsi then announced on Aug. 20 that its offer to acquire the company for $3.4 billion had been accepted. Sales for the quarter that included June were up 31% year over year, reaching $171.5 million and beating the average analyst revenue estimate by roughly $22 million. Earnings for the period jumped 82% year over year to land at $1.14 per share -- trouncing the average analyst estimate of $0.71. In conjunction with the fantastic quarterly results, SodaStream delivered a strong slate of guidance revisions. The company raised its annual sales growth target from 8% to 15%, and its operating-income growth target from 15% to 44%. It also increased its EPS growth target from 8% to 31%. SodaStream's big month wasn't over, however. PepsiCo then announced that its offer to buy SodaStream at a price of $144 per share (valuing the company at roughly $3.2 billion) had been accepted. Here's Pepsi's incoming CEO Ramon Laguarta discussing the value that he sees SodaStream adding to his company: "SodaStream is highly complementary and incremental to our business, adding to our growing water portfolio, while catalyzing our ability to offer personalized in-home beverage solutions around the world. From breakthrough innovations like Drinkfinity to beverage dispensing technologies like Spire for food service and Aquafina water stations for workplaces and colleges, PepsiCo is finding new ways to reach consumers beyond the bottle, and today's announcement is fully in line with that strategy." The $3.2 billion deal valued SodaStream at an 11% premium compared with its closing price on the day of the announcement, and a 32% premium based on its 30-day moving average. How exactly the acquisition will play out for Pepsi over the long term is difficult to map, but it has the potential to be a good fit with the beverage giant's diversification initiatives. Motley Fool contributor Jeffery Bowman recently weighed in on the buyout and thinks Pepsi got a great deal. Sales of SodaStream's sparkling-water maker are booming, climbing 22% last quarter to surpass a million units. Pepsi is looking to continue its move away from sugary beverages and toward healthier options to keep up with shifting consumer tastes. It expects the deal to close by January 2019. What's Putting the Fizz in SodaStream's Resurgence?